There are always challenges in writing up your research. Sometimes the problem is to do with the process of the actual writing itself and other times it concerns how to ensure that all the aspects of the research which have to be mentioned in a research dissertation are included in the right place and to an appropriate level. If this is addressed appropriately, writing up can be accomplished relatively easily, but if it isn’t managed well writing up can become a burdensome event. 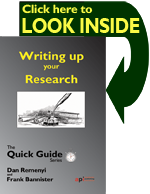 Having a high level overview of what is required when writing up your research is one of the ways of making this job, which many researchers find daunting and arduous, much easier. This book is in four parts: Writing; the Body of the Dissertation; the Leading Pages; and the Appendices. 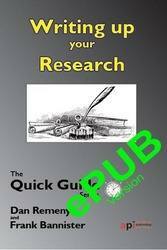 This book contains the information you need to write up a research dissertation or thesis and how to go about producing this work in a controlled and satisfying way.